The first time I stepped into this someday chicken house shack I noticed more light coming through the decaying fiberglass roof than the broken window at the front; but I knew it was sturdy, having survived countless Southern Ohio snow, rain, high winds, lightning storms and tornado warnings. The building further back is bigger and nicer but a bit too close to our neighbor to keep a rooster. Before I could imagine chickens in this shabby shack, there was much to be done. Sweeping out a decade of spider webs, dead bugs and convincing the wasps to relocate was a great place to start. Ripping off the old roof and replacing it with white enameled metal panels has helped keep the chicken house cooler when the thermometer hits 90F - 100+ and dry inside. There were signs that the two front windows and most of the west facing side of the building were made removable, so, I removed them. With a little work, paint and hardware the front windows, now lined with chicken wire, are hinged at the top and can be propped open to let the chickens in and out. Every night they are closed with raccoon proof latches. In winter I attach plastic liners to the two front windows to cut down on cold drafts, moisture and wind, removing the plastic once warmer spring and summer nights arrive. Removing the two large panels on the west side left a wide open area, great for warm weather ventilation. Some chicken wire, a new plywood floor and some white barn paint inside made this little chicken house ready for chickens, even before the chicken yard fence was started. 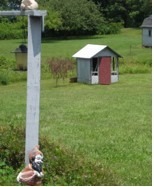 Craigslist was a great resource for finding a mixture of Point of Lay hens and a fine rooster, not too far from home. Brown eggs are nice, but green are magical, so getting 2 Ameracaunas for $10 was a real bargain! Our fence is a home-made design. At the bottom is 2’ high chicken wire, secured to the ground with home-made PVC tent pegs. It had been my plan all along to create a huge yard, large enough for chickens and a summer garden. Dividing the chicken house yard allows me to rotate the chickens from one yard to the other and keep them out of my summer garden until I want to let them in. 6’x2”x4” welded wire, starting at the top of the chicken wire, attached with hog rings, makes an 8’ fence that’s kept all the chickens in, and rabbits and deer out. Unfortunately raccoons and possums climb fences, so the front chicken house windows and door get latched securely every night. The side windows stay open spring and summer, since the chicken wire is permanently and securely attached across the full opening. Tall metal fence posts were too expensive, so we purchased 6’, on sale, and attached inexpensive grey PVC extensions with nuts, bolts and washers. Cut notches at the top of the PVC pipes are perfect for keeping the top line of the fence stretched skyward and straight. The walk-in human door can be propped open or kept closed depending on the weather The two removable side panels on the chicken house made a great temporary shady spot until we hinged and attached them at the top of the now chicken wired opening. With 2x4s we created a lean-to frame on that side of the building. A temporary tarp creates a good sun, rain and snow shelter with the side windows open or closed. The large windows swing out and latch open, hooking to the 2x4s, and latch closed to the building. 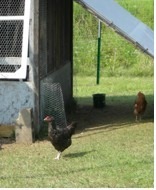 They allow for an easy adjustment to weather changes, warming or ventilating inside the coop. Some day the tarp over the lean-to will be replaced with enameled metal panels matching the roof. The lean-to shelter on the west side was a big hit at the chicken house, so we built one on the East side, too. Adding a thick layer of gravel around the chicken house has kept mud down and is easy to hose down breaking up droppings that dissolve into the ground below. Water buckets in the shade provide a constant supply of cool water. Chunks of ice added to the buckets on the hottest of days provide short lived but welcome refreshment. 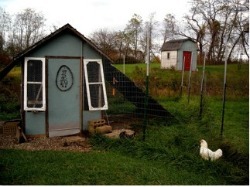 A mini saw-horse under one front window and a cinder block stair case at the other provide easy entry back into the chicken house where there are roosts, nest boxes, feed, grit and water. 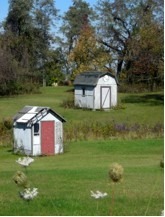 The evolution of this chicken house and yard has been surprising to watch, even though my husband I did all the work. It’s a pleasure to provide this spacious enclosure for the chickens with a garden safe from rabbits and deer. Most afternoons, once most eggs are laid, the main gate is opened and the chickens are allowed free range of our 5 acres. They seem to prefer to come up around the people house, but like to explore the orchard and next door neighbors’ yards, too, for bugs and seeds and such. Straw bales were laid out in the fall creating a compost pile for used shavings from the chicken house floor and composting raised straw beds for spring planting of organic vegetables. With plastic on the front windows and all closed up tight for the night, even the coldest of nights, provides a draft free chicken house. Inside for the night, the chickens snuggle together on their roosts, keeping their feet and each other warm. 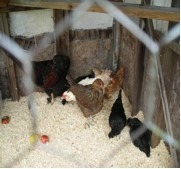 Under windy freezing weather conditions the chickens prefer to stay inside. But on a brisk morning of sub-freezing temperatures, even in the snow, if the sun is shining, they want out. The compost pile, allowed to compost through fall, winter and early spring and topped with composted horse manure, made for lots of wonderful tomatoes, with a few green pepper plants that did well, too. The straw bales helped create a raised bed for easier gardening and good water retention, plus rich with nutrients and a great mulching effect against weeds. Fresh tomatoes and zucchini are particular favorites for us and our chickens, so I try to plant enough for all in the people house and the chicken house. We seem to have many ideas for improvements, including electricity and the permanent lean-to roof panels, but I long to finish the breeding brooding pen. It needs a safe nesting area for broody hens, separate from the rest of the flock with a way for the hens to bring their hatched chicks back into that safe nesting area each night. 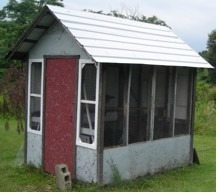 I plan to enclose it in a covered yard, attached to the back of the chicken house, to protect small chicks from hawks. I’m hoping by the time I need that pen the finances and design will come together. We had a surprising improvement to the look of the chicken’s house this fall. An unexpected exterior people house repair led to repainting the whole house and some of the out buildings with a pleasant new color. It seems as long as there is paint in the bucket, and nice weather, I just keep painting.